Learn about the temperament and personality of the West Highland White Terrier. Discover what he's like to live with, his traits and characteristics and how he generally behaves. And look at lots of West Highland White Terrier photos. Often known as the "Westie," the West Highland White Terrier possesses the classic terrier temperament: active, spunky, energetic, and self-important! These little guys are confident and will stand their ground, regardless of the size of the other dog. They have a streak of willful stubbornness and like to do things their own way, in their own time. Their human will have to establish him or herself as the pack leader, or a Westie will try to take over. Westies love to bark, and are fairly loud for their size, which makes them an excellent watch dog. However, they are easygoing, friendly, and might try to lick a robber's face. Westies are good with other dogs, but have been bred to chase small prey, so usually are not very good with cats. (They also may play too roughly to be safe with really small dogs.) Putting a Westie into a household with a pet bird, hamster, rabbit, or other small animal is not a good idea. Though a Westie is small, he is not really a lapdog and not all that cuddly. He won't need much pampering and is more than happy to go for a walk in the rain, splashing mud puddles up onto his white fur. Westies are very intelligent and need to be kept stimulated so they don't get into trouble. They enjoy daily walks, and most enjoy swimming. Some Westies enjoy a game of fetch -- some don't. Most of them love to dig, and don't make good companions for gardening. They've also been known to dig their way under the backyard fence and disappear. You might then get a call that your dog is terrorizing the neighbor's cat. When well supervised, Westies will be fine with polite and gentle children. However, Westies get nervous around toddlers who run at them, pat them roughly, or pull their ears or tail. Sometimes the squealing and giggling of a young child will remind a Westie of its prey. Because a Westie likes to be in charge, he might act bossy around kids. Many breeders recommend Westies only go to homes with children over ten years of age. Westies are entertaining, active, happy, loving, and busy dogs who make great travel companions, because they like to be on the go. The West Highland White Terrier is moderately easy to train. He learns new commands at the average rate. He is neither difficult nor easy to train. 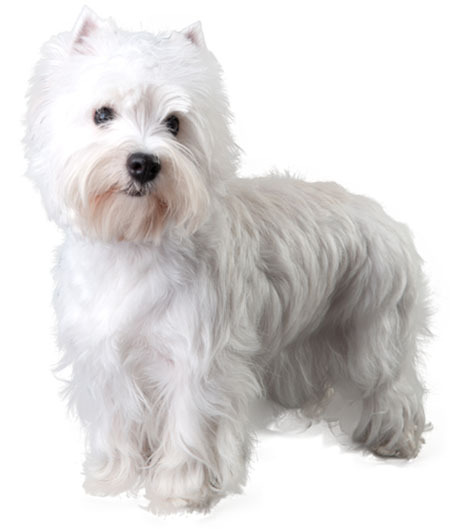 The West Highland White Terrier sheds practically no hair at all. You'll virtually never find a hair in your home!